An inspiring vista of the Farmington Valley view was revealed when the Mayocks cleared a small pasture for their ponies at Fiddlehead Farm in North Granby, Connecticut. That exceptional view is the backdrop for The Antiques Barn at Fiddlehead Farm and for the family and farm life that Louisa & John so enjoy. 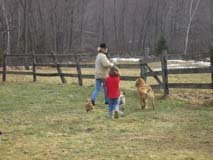 When Louisa closed her unique clothing and gift shop in downtown Granby, to more fully focus on raising her four children, she knew that her creative talents would keep her busy on the farm. Joyce Kennedy Raymes joined forces, a few years back, to partner with Louisa in the establishment of the Fiddlehead Antiques Barn and Fiddlehead Tours. Louisa and Joyce get alot of satisfaction recycling pieces from the past, and reusing these charming, vintage items ~ and they think you will too! Whether you live in the Farmington Valley View, or are just visiting, stop by Fiddlehead Farm to say hello.